The FarLinX Mini Gateway is the smallest member of the FarLinX Gateway range - it can handle your smaller scale single X.25 line to TCP/IP migration requirements. It offers many of the same features as in the larger FarLinX X25 Gateway range but at a lower price and in a more compact enclosure. The Gateway supports XOT to X.25 switching, X.25 to TCP data translation and connection routing, TCP to XOT, a Triple-X PAD, and a Host PAD. All this is easily managed from your browser. There are also daily activity logs with a selectable level of detail, automatically archived on a daily basis. The SNMP support provides alerts for a numerous different conditions including critical events such as line down and line up. 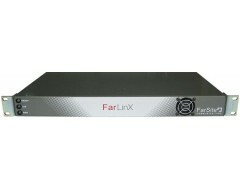 The more powerful FarLinX X25 Gateway range is more suitable where multiple and faster X.25 lines are used.